This story was updated on March 9 at 10:37 a.m. ET. NASA's space shuttle Discovery may be hanging up its wings after one last mission, but it leaves a long legacy behind that will be a challenge for any future spacecraft to match. Discovery is NASA's oldest flying space shuttle and the most traveled winged spaceship in the fleet. It has flown more missions, and carried more astronaut crewmembers, than any of NASA's other shuttles, agency officials have said. The shuttle returns to Earth today (March 9) after flying its final mission – STS-133 – to the International Space Station. The 13-day mission launched on Feb. 24 and delivered a new storage room and humanoid robot (called Robonaut 2) to the International Space Station. Discovery will be retired along with the rest of NASA's orbiters later this year. It is the first shuttle to retire, with NASA expected to announce where the shuttles will be displayed on April 12. 148,221,675: The number of miles Discovery has traveled after 39 space missions. This is a distance record unmatched among NASA's space shuttle fleet. The miles traveled by Discovery could have carried it to the moon and back more than 288 times, or on 1 1/2 trips to the sun. 40,000: The number of spectators, according to NASA estimates, who watched Discovery's final launch from the Kennedy Space Center in Cape Canaveral, Fla., on Feb. 24, 2011. 17,400: The speed at which Discovery traveled (in miles per hour) to remain in orbit. It's about Mach 25, or five times the speed of a bullet. 5,830: The number of orbits Discovery has flown around the Earth after its final flight. During spaceflight, Discovery completes one orbit around Earth every 90 minutes. 1984: The year Discovery blasted off on its maiden space voyage. Discovery's first flight was NASA's STS-41D mission, which launched on Aug. 30 carrying three communications satellites and an experimental solar array wing. The mission was commanded by astronaut Henry Hartsfield. 365: The number of cumulative days Discovery will have flown in space by the end of its career. Altogether, that's 52 weeks. Put another way, if you were to string all of Discovery's mission's together into one mission, the shuttle would be in space for exactly an entire year. 246: The number of crewmembers Discovery has carried during its space career so far. According to NASA, Discovery has been the ultimate space taxi and carried the most astronauts of any shuttle. 39: The number of missions Discovery will have flown by the time it is retired. 13: The number of times Discovery will have docked with the International Space Station after it is retired. 5: The number of astronauts that marked a first-ever in space when they flew on Discovery. According to NASA, they include: the first female to ever pilot a spacecraft (former astronaut Eileen Collins); the oldest person to fly in space (former astronaut John Glenn); the first African-American to perform a spacewalk (former astronaut Bernard Harris); the first cosmonaut to fly on an American spacecraft (Russian spaceflyer Sergei Krikalev); and the first sitting member of Congress to fly in space (former Utah Senator Jake Garn). 4: The number of years it took to build the space shuttle Discovery. 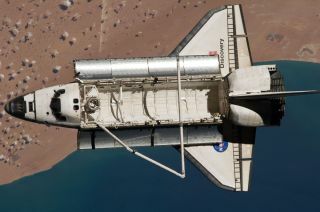 The shuttle was completed in October 1983 in Palmdale, Calif., and was shipped a month later to NASA piggyback atop the agency's modified Boeing 747 shuttle carrier craft. Four is also the maximum number of times the shuttle has flown in space in a single year. In 1985, Discovery set the bar for number of flights by one orbiter in one year. 3: The number of satellites Discovery carried during its first launch. Discovery was also NASA's third space shuttle built for orbital flight. It was built after the shuttles Columbia and Challenger. 2: The number of return-to-flight missions Discovery has flown to help NASA resume shuttle flights. Discovery was the shuttle that flew the STS-26 mission two years after the loss of shuttle Challenger and its crew during launch on Jan. 28, 1986. The shuttle also flew the STS-114 mission that followed the 2003 loss of shuttle Columbia and its seven-astronaut crew. That mission launched in July 2005. 1: The number of actual dockings with Russia's Space Station Mir. Discovery actually visited the Mir station twice. It was the first U.S. shuttle to rendezvous with (but not dock at) Mir in 1995. Its second and last trip to Mir was in 1998, when it actually linked up with the Russian space station.